Ear infection remedies have been top priority here since our first run in with an ear infection with my two year old. She and I were up until the wee hours of the morning, and she was in so much pain that I ended up taking her to the ER for her first antibiotic. When I discovered natural remedies, ear infections were at the top of my list to research. And through the years, we’ve not had to make a return trip to the ER! I’ll share all of my secrets with you for treating ear pain at home. One is the result of fluid behind the ear drum, which is often associated with a runny nose and cold symptoms. The pain is from the pressure on the ear drum. Most commonly, this form of ear infection is viral. The other is an inflammation of the ear canal, often called “swimmers ear”. This also strikes suddenly, but often after swimming or bathing, and without the usual cold symptoms. I have had good results using half vinegar & half alcohol at the first sign of swimmers ear. I actually packed a washed out eye drops bottle of it in our swim bag, and have used it right at the pool several times this summer. First, I check the ear, and made sure that the eardrum is intact…the ear canal looked red and swollen. I mentally assess: have they been swimming? Are they teething or starting to get a little cold? Are they simply uncomfortable or in major pain? Time for a home remedy to get this under control quickly. I head into the kitchen and grab…an onion! A traditional ear infection remedy is to put a half of a warm on onion over your child’s ear, or to put a few drops of onion juice into the ear. This makes a lot of sense when you consider the properties of onions. They contain the same strong antibiotic/ antiviral, and anti-fungal ingredient found in garlic, called allicin. But onions also contain a larger dose of a natural anti-inflammatory than garlic, which explains why they are preferred over garlic for ear and chest/congestion complaints. Onions are a good traditional ear infection remedy for both kinds of ear infection, in our experience. You can use a warmed half of an onion, or use the juice. I’ll show how to use both, and the pros and cons of both below. The benefit of using onion juice is that it’s very quick. I tend to opt for this if my child wakes up with ear discomfort, as they’re able too just go right back to sleep after the juice is in their ears. One downside is that it’s a little tricky to extract the juice from an onion. I’ve heard of numerous ways to extract onion juice, from grating and squeezing, to using a garlic press. Onions usually aren’t really all that ‘juicy’, and you don’t want pulp going down into the ear. Here is my SUPER EASY solution…the easy ear infection remedy that I just used tonight, when my daughter was complaining of ear pain. I cut the root end off of an onion. Then I held the onion on its side. 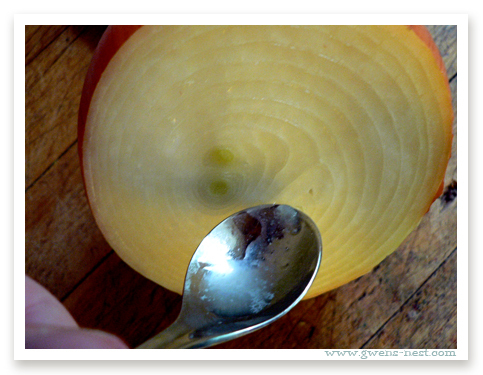 Using the tip of a spoon, I scraped up the newly cut end until I had several drops of onion juice in the spoon. I had her lay on her side with the hurting ear facing up, and I dripped the juice right into her ear. She kept her head tipped so the juice would stay in, and covered it with a cotton ball. In just a few minutes, her pain was gone, and she was able to turn over and go right to sleep. Onion juice can be repeated as often as needed when and if the pain returns. ***Update*** If you’re going to treat one ear, go ahead and treat both. That would have saved us both some sleep. I did repeat the remedy the next morning as well, but we have not had to repeat again. There is one benefit to using the onion half over the juice: Sometimes, the feeling of “water” in the ear is a bit traumatic. If your child is picky about water in their ears, or if there is *any* chance that the ear drum could be perforated, you can do this method instead. Simply warming half of an onion on a skillet until it’s very warm (but not hot enough to burn!) and holding the cut side over the ear. Onions heat VERY quickly, so be careful not to over-warm it to the point where it burns. The vapors of the onion are plenty potent enough to do the job. I hold it on for a couple of minutes. Don’t be surprised if the ear or skin turns red…onions are a rubefacient, meaning they pull the blood flow up to the surface of the skin. We treat both ears, and also the neck just below the ear, as the eustachian tube that drains the inner ear into the throat can also swell closed. 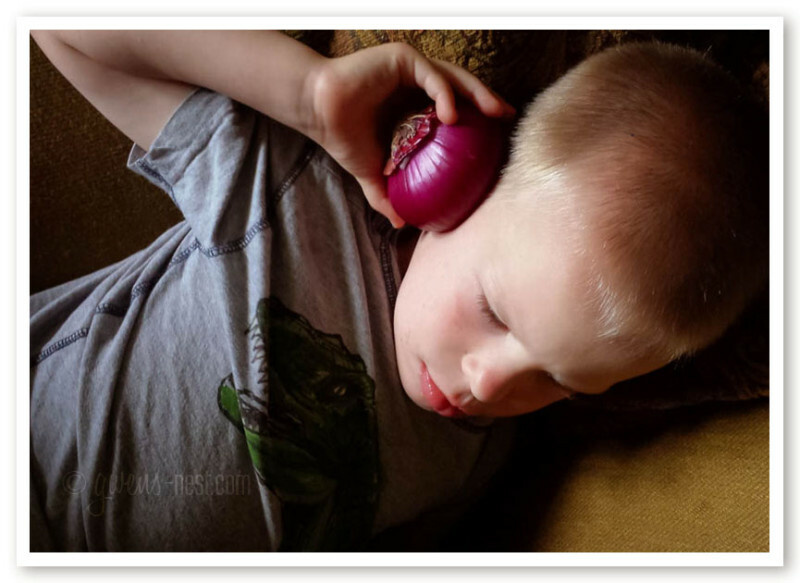 To learn about the science behind why onion is such a time honored home remedy for ears (and which color is the most potent), check out my post here about onion nutrition. I keep a few other products on hand for handling ear infections. There are several natural and homeopathic products for treating ear pain. 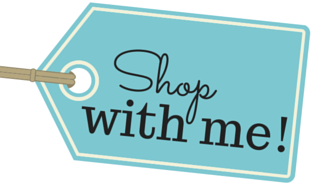 The following links are Amazon affiliate links. I’ve used these Hylands Earache Drops and have heard great things about this Garlic & Mullien ear oil too! I’ve also had great success with combining these other remedies with an amber necklace to help ease the pain and inflammation. I discovered the benefit of using raw amber when my baby was teething. You can layer multiple necklaces for even more effect. (We used two for molars and eye teeth.) We use these same necklaces now to treat sore throats and ear pain. Another nice benefit to owning my own is that my kids are now used to it, and they are not scared at all when they go to the Dr., and he looks in their ears. Which makes check ups much less traumatic. Please note: Never put anything into the ear if you suspect that the ear drum has burst, and/or if you see blood or fluid coming out of the ear. If a person is allergic to onions or garlic, or experiences pain or irritation with the remedy, then discontinue use. Not all infections respond to these remedies, and some may a doctor visit and internal antibiotics. just wondering, my 4 1/2 year old had her eardrum rupture, and she’s been through the antiboitics (I think the first time she’s had any), but the ENT thinks she’s headed for a tonsilectomy, adenoidectomy, and tubes in both ears (fluid behind eardrum of non-ruptured ear) I loathe the idea, and am curious what you’d do in this case. When I was really little, I got recurrent tonsil infections, and was scheduled for surgery. My Mom heard about using the herb alfalfa for it, and started me on it. My infection cleared up and never returned. I’d give that a shot, and also elderberry. Most ear infections are viral, and an immune boosting/anti-viral protocol would be really worth pursuing prior to surgery, IMO. Also, elevate the head of her bed, to help drainage move down into the stomach, and away from the ears. The tonsils and adenoids are an important part of the lymphatic and immune system…I’d much rather work on recovery than remove them surgically. I pray that you find a naturally minded practitioner who can help point you in a good direction for her. I’ve heard xylitol products can be VERY beneficial for kids who suffer from frequent inner ear infection as well. You may look for more info on that. We use toothpaste and gum/mints that are sweetened 100% with Xylitol. You can also apply garlic presses around the outside of the ear or on the neck/throat when you suspect infection. The garlic and onion remedy posts would be worth reading. Thanks for the replies! I ordered and received my otoscope yesterday, and see that the non-ruptured ear still looks red inside. However, her ENT had to cancel her follow-up appointment today, and I am rejoicing over more time to try these natural immune boosting methods! Wonderful! The onion can be cut and just held over the ear…the vapors alone are anti-inflammatory and work really well. It works quickly! A couple of years ago an ENT was suggesting my son get his tonsils out because they were very large. The time came where we had to make a decision and we just felt uneasy about it. My hubby happened to run across a study that indicated dairy products can really affect the tonsils. We reduced his dairy intake and when we took him back to the ENT he said that the tonsils had reduced in size and he no longer saw the need to take them out at this time. Might be something worth looking into if your child consumes lots of dairy. Yes! The tonsils are responsive tissues that are tied into the immune system…I’m not a fan of removing them either. 🙂 Better to find out WHY they are enlarged! I’m definitely going to do this for our baby when need be. I have one question though. How do you prevent the onion from burning the babies eyes? I’ve never had a problem with that, but I usually use a dropper for the juice for a tiny baby…so baby is usually not with me in the kitchen, and I just carry it in to where they are. Once it’s in the ear, it’s fragrant (you’ll suddenly crave Italian food when snuggling your baby) 🙂 But it’s not powerful enough to burn the eyes. You can test the juice on the skin first if you’re concerned. I know some people have allergies to garlic, and onion is in the same family. So err on the side of caution for the first try. The photos of how you cut the onion are a great addition to the explanations. When researching about home remedies I also read that cooking the onion first would make the juice less stingy – did you experiment with that as well? 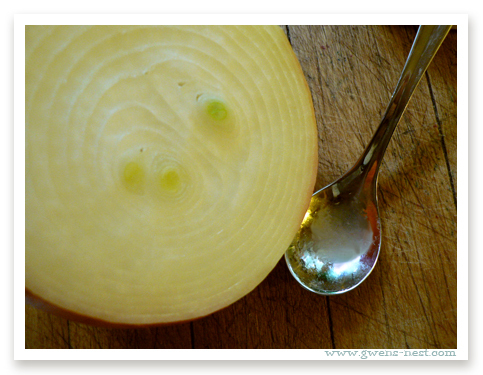 Cooking does deactivate the allicin or sulphur compounds, which is the antibiotic portion of the onion. So if that’s of interest to you, then I’d just slightly warm it. The anti-inflammtory component is still active even after heating, though. Ah great to know thank you! Can I use the onion again after the 1st use? With onions, there is also a powerful anti-inflammatory component that does NOT degrade, even in cooking. So you MAY continue to use it if you’re mainly wanting that portion of the remedy. Hi there. My 2.5 year old daughter who has been super healthy since birth got a cold this past Oct and has been severely congestions since, has had three ear infections and the doctor is recommending tubes, tonsils and adenoids out. I have tried saline, nasonex, allergy meds, vitamin c, d, kyolic garlic (liquid), steam inhalation. She still has fluid in her ears… I am wondering would this onion remedy help or is it just for actual infections? It’s my understanding that the onion addresses inflammation and microbial growth. In this case, it sounds like she’s got a chronic issue. Have you looked at the use of Xylitol for recurrent infection? That would be worth looking into for her. Lymph massage may also be a good direction to look at, as well as propping her pillow at night so all fluid drains down and doesn’t pool in her inner ears.. Personally, I would get a second opinion on removing the tonsils/adenoids, as they are important components of the immune system. Avoid all dairy and sugar products to expedite healing. Even all animal products will trigger infection. Give ur child plant based diet 1 month – 3mos. I was going to try something like this myself. I can’t tell my husband though, he will think it’s hooey, but I remember my mom doing it and it worked. I certainly will NEVER tell my mother or sister in laws! 🙂 The proof is in the pudding, I always say. I’ve had so many Mamas who have been shocked that this worked well for them! What type of onion did you use? Yellow, sweet, red? I use red if I have it, as it’s got the highest concentration of the anti-inflammatory quercetin. But *all* onions have this compound, so use what you have. I don’t usually reach for remedies that are unpleasant for my kids, because I don’t want them to associate home remedies with pain or gross tasting concoctions. So I’d probably not try the onion just for that reason. We did end up using 2 necklaces for the heavy duty teething like eye teeth & molars, and it did the trick for us. My son went from not being able to sleep, to sleeping soundly within an hour of putting on the 2nd necklace. 🙂 Getting them wet won’t hurt them, but chlorine isn’t supposed to be good for them. I am definitely going to try these the next time we have ear issues. Hello and thank you for this post!!! My son suffers too much from these and they are usually sudden. Tonight was one of the worst I did as your post said and he’s in no more pain. But my question is: do I leave the cotton ball in the ear when I put him back down for bed or do I take it out. And if I take it out how long do I leave it in for? Hi Gwen, My son is 15 months old and has had 7 ear infections. One more and they are recommending tubes. His ears are currently not red, but fluid is present. Will the onion help the fluid drain? And possibly prevent an infection? If I do use an onion and he won’t let me hold it to his ear, would you recommend onion juice on a cotton ball in the ear? I’m too afraid to put anything inside the ears. I am also currently giving him probiotics and thinking of cod liver oil too. Is there any combination of these things that you would not recommend? And last question – would the onions work if they were near his head while he is sleeping? Many thanks !!!!! Do you have a remidy for to much wax in an ear?what can yu do for it? My Mom used to use the rounded end of a hairpin to gently remove extra wax. But that has to be done with great care. Hi I was just looking through some home remedies for my 5 year old who is on her second set of ear tubes…is it safe or will it hurt her if I used onion juice in her ears?? Her Having tubes I’m afraid to try anything. But we are so desperate! I would not put anything in the ears with tubes. But you should be able to use just a warmed half of an onion held over the ear or on the neck below the ear targeting the eustachian tube area. HORRIFYING ADVICE. I am a ENT. Your blog was brought to my attention tonight in the ER. BY ALL MEANS DO NOT FOLLOW THIS ADVICE- YOUR CHILDS HEARING IS AT STAKE. Can you explain why this is dangerous? I’ve used half of an onion or the juice many, many times to clear up ear pain, and it’s so quick and easy. We’ve never had any problems from it. It’s a very old, time tested remedy. Onion remedy is really amazing.